Coco growers that really want the best of the best choose CANNA COCO. 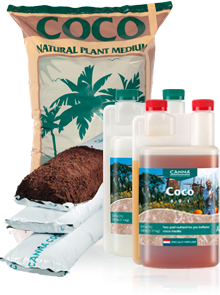 It is a sophisticated combination of high value coco substrates and fertilizer that guarantee the best results. CANNA COCO substrate is more airy than for example potting mix. This means there is more room for rooting and plants get much more oxygen. This stimulates growth and bloom and produces bigger yields. CANNA COCO substrate is environmentally friendly. No energy wasting production methods are used during the production of this long-lasting, cultivation substrate. Coconut fibres are obtained from the coconut husks which are a natural product that can be harvested throughout the year. It's easy to grow on CANNA COCO. All the nutritional elements for the growing and flowering phase are present in the CANNA COCO A & B nutrients. Due to the unique buffering capability of the CANNA COCO substrate (it binds nutrients and releases them), and its sponge-like structure, the nutrients needed to ensure high yields are stored in the coco. This means that the plant itself can regulate the amount and timing of its nutrient intake. Coconut fibres have sufficient capillary action to retain enough water and nutrients. This means that the period between waterings can be longer if needed.